My people will soon explain their timing and decision processes for helping me be free of my cancer ridden body. But let me share why I had to leave this earth on Friday, October 3, 2008. You see, it was in Assisi, Italy on October 3, 1226, that one Franciscan friar by the name of Giovanni Francesco Bernardone was laid to rest. Catholics know him as the patron saint of animals, the environment and Italy. It is customary for Catholic churches to hold ceremonies honoring animals around his feast day of October fourth. I had to be there for him. My people now believe that I let them know it was my time last week because I needed to sit at the feet of St. Francis while we blessed all the animals, brought to all the churches, everywhere, last Sunday. Which we did. My people like to consider themselves more spiritual than religious, but this story touched them deep. And they thank my aunt for letting them know about the blessings Sunday. (Tommy will enjoy nine happy healthy lives.) I thank her for not letting them know, before I had to go. It was too late for me to be blessed in that life. And thanks to St. Francis – and all the loving prayers from our forum friends – my new life is happy, healthy, and eternal. Where there is darkness, light, and where there is sadness, joy. My people thanked me as they held me on mine. And we all wept. I thank you all for your continued blessings of love. With your continued support, we shall keep on keepin’ on. For tripawds everywhere. Our Hike Shall Go On . . . I am so, so very sorry to hear about your loss of Jerry… I haven’t been able to log on in awhile so I’m just trying to grasp what I’ve been reading. I realize that we’ve never been able to meet in person, but I cannot tell you nearly enough of how incredibly grateful we are to have found you and your site. Even though it’s just a matter of simply sharing thoughts online, it didn’t hit me until tonight as how lucky I was to have come across you. You have helped me over the last few months with the constant support and reassurance while Smokey and I have gone through our personal situation. I didn’t realize how exactly connected I’d been to this site until tonight. Jerry, you are so very lucky to have had the best pawrents ever – you have all truly been an inspiration for those of us having to face cancer and amputation for the first time ever. I can’t even begin to express the amount of gratitude we have for all of you. I know Jerry isn’t far 🙂 He will always be with you in your hearts and spirit. Simply put, but with so much more meaning than these few words, we can’t thank you enough. That two people would take the extra time to photograph, record, create, write and describe every step of the way of Jerry’s time with cancer is just saint-like for all the rest of us who each and every day stumble across your site with tears in our eyes, reeling from diagnosis. The more one reads, the calmer one becomes as they see the value of gathering information while loving and playing with abandon in the meantime. I thank you for this site, for sharing your story so intimately, and for connecting dog-lovers with each other. my world is filled with people who probably don’t understand why I’m bothering with all I do for Uschi. I hear things like “when I die, I want to come back as your dog…”. At the end of the day, I have been able to come here, to read, to learn, to cry, and to love all the doggies. and I’m not embarassed about it at all, thanks to you, and thanks to sweet, special, silly-sue Jerry. may he always run with a warm breeze in his face with a friend at his side, human or otherwise. we loved him. We are so sad to hear about Casey, but thank you from the bottom of our hearts for giving her a chance at a longer life on three legs. She thanks you too. We know it’s so hard (oh boy do we know) but try not look at it as an awful decision. Tough, yes, but above all, try to remember that it is the most compassionate thing that you, as a caregiver and dog guardian, can do for your beloved girl. You have the wisdom and ability to see that she is not enjoying her present quality of life and as hard as that is to accept, it truly is a gift to understand things as they are, and not allow her health to deteriorate any more. Dogs have such a huge amount of dignity and pride. To allow them to leave this world in the same courageous state as they arrived is something that we humans have the hard, but courageous, task of doing for our beloved friends. It won’t be easy, and it will hurt. But ultimately, try to remember that she understands, and thanks you for making such a heavy decision on her behalf. We are here for you. If there is anything we can do to help, please let us know. I’m so so sorry to hear about Jerry. You did the right thing setting him up with St Francis. Today I made the awful decision that my 3 legged golden retriever beauty Casey will go to the Rainbow Bridge (in about 2 weeks). Her surgery went perfect to remove her leg, but since has developed serious balance and seizure problems. That, with only 3 legs makes her fall on her face constantly – it’s no way for her to live. She’s almost 14 and I have had her for 9 wonderful years. Beautiful, sweet, intelligent and absolutely loving, God was in a great mood when he made her. I have been blessed beyond belief (as well as everyone else who ever encountered her). Hi Jim. This is my first time at this site as I am trying to make a very tough decision for my 9 yr. old Golden Retriever, Abby. She had a hip replacement surgery about a year ago and 1 1/2 weeks into recovery, she slipped on tile and broke her femur in her surgery leg. She had another surgery to fix that which consisted of putting a stainless steel plate and screws into her leg/femur. Needless to say, she had broken the same leg three more times since then, two more surgerys to fix it but this time we are faced with amputation or putting her down. She is almost 100 lbs. She is in a lot of pain right now. We need to make a decision soon. I can’t stand the thought of her not being able to get around and falling on her face…as I have read about others doing. Her other hip is not in that good of shape either. It wasn’t as bad as the other one, but now she’s putting her weight on that leg. We’ve spent thousands of dollars trying to fix her…because we love her so much. She is the sweetest dog I’ve ever had. I want her to die with dignity. Anyway, that’s the decision we are facing. I think we’ve pretty much made up our minds….I just wanted to talk to someone that has been through amputation and see if they felt like it was worth it. Her weight is what concerns me the most….on her being able to get around. Any comments or suggestions? Thanks for asking Terri, and bless you for taking such good care of Abby. Check out the discussion forums. You will get much more feedback there than we alone can offer. I bet everyone there will tell you it was definitely worth it. Also see our giant breed tripawds gallery. You can’t miss Tazzie, a 175lb three legged English Mastiff! We thank you all so much for your continued support. Comments like these make it all worthwhile. But we really couldn’t do it with out your help. Thanks. We just found out about Jerry and although we have been part of the tripawd family for only a short time we feel we are just that…family! Jerry truely was an angel sent from God. He inspired you and enlightened you to do great things that in turn has inspired and enlightened all of us who have had an opportunity to come to this site for guidance, support or just plain hand holding. If not for this site, we may have decided against Cody’s surgery, if not for this site there were many times I felt lost, scared, worried or was second guessing decisions for my furbaby. You and the rest of this forum family were always there. I have also tried to pass it forward to others who are just starting their journey and just need to know they are not alone. This website and forum is the greatest way you could have ever honored Jerry…he will always live on in our hearts and in the many lives he will touch as more and more people visit this site for guidance with their own Jerry’s and Codys by their side. Thank you from the bottm of our hearts. Fly with the angels Jerry!! Thanks for sharing your personal thoughts and feelings with us, left here behind with your pawrents. 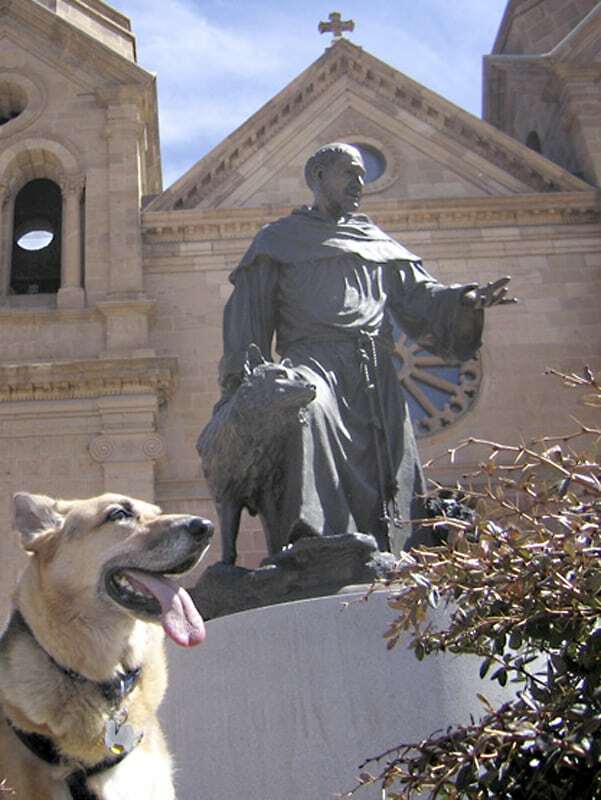 St. Francis surely is smiling upon you and blessing all of the precious animals here on earth. Your blessing is all around you and we know that you feel that blessing constantly. We love the photo of you with St. Francis. Your goodness is turned upon every living thing; Your grace flows to all Your creatures; Your Light touches each of us with the reflection of Your love. Grant long and healthy lives to our special animal companions. Bless their relationships with us, and if You see fit to take them from us, help us to understand that they are not gone from us but only drawing closer to You. Grant our prayer through the intercession of good St. Francis of Assisi, who honored You through all Your creatures. Empower him to watch over our animal friends until they are safely with You in eternity, where we someday hope to join them in honoring You forever. Amen. Thanks you so much for sharing this part of your story. How wonderful! We’re not exactly religious around here either but we love dear St. Francis. His prayer is truly beautiful and teaches a way of being that is hard to achieve but is always to be aspired to–at least for humans–us dogs already know all about pure love. Me and my brotherdog each have a St Francis medal on our collars to help keep us safe. It cheers us so to think of you keeping him company and helping him to bless all the rest of us. Yeah, we love the idea of St. Jerry, patron saint of tripawds! You wear that halo well big Dawg. p.s. OKim1–my mom would love to know the words to your novena prayer for sick animals…. I am so sorry to hear about Jerry’s passing. I want you to know that my dog Leo had to have his front leg amputated earlier this year back in March. Even though his accident was do to a car and not cancer I found great solace, comfort and love in this site. When I picked him up from surgery I had a “Proud to be a Tripawd!” shirt in hand for him to wear while he recovered and proudly display my “TRI” sticker on my car!! Thank you so much for creating this website and posting all your videos. Jerry has helped a lot of people find comfort when going through such a hard time. Please don’t feel like you have to rush and tell us about the timing and your decision processes. I think everyone realizes that these are very private memories that you hold and we can certainly wait for a time when you may feel more comfortable sharing these thoughts. If you choose to keep these thoughts private, I know I will understand and I hope others do too. One could argue for St. Jerry – patron saint of the tripawds, watching over all of us now. Continuing to educate and comfort in our time of need. Blessed Be Jerry. Your people do and will continue to miss you! You brought them so much happiness and joy. I’m so sorry to hear of their loss of you, but happy to hear that you are no longer feeling the burden of cancer! Ps the picture of St Francis is a remarkable liking … I’v e always seen the St around birds rarely a dog . Makes me want to travel there to check it out 🙂 You have a keen eye for detail. Will check back to read on …. When Buster was first misdiagnosed I prayed to him all the time… He was also blessed before his surgery…. Make Me a Channel of Your Peace. Amen.